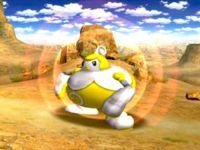 The Subspace Army is an evil organization made up of formless beings in the Subspace Emissary of Super Smash Bros. Brawl. They are the main antagonists, led by the mysterious character, the Ancient Minister. It is later revealed that the Ancient Minister was forced to lead the army by Ganondorf, Bowser and Wario. The trio were the ones truly controlling the army and did so under the orders of Master Hand. Master Hand is later revealed to be controlled by Tabuu, the true leader of the army. 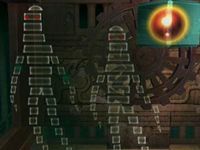 The Subspace Army's main troops are a group of small shadow beings, known as Primids. Their goal was to pull the entire world into Subspace so as to destroy it. They hoped to accomplish this by using a powerful and deadly weapon known as the Subspace Bomb. The army is also in command of a large assortment of weapons and doomsday devices such as the Subspace Gunship, a flying fortress that could trap entire areas in subspace without the use of the Subspace Bomb. Petey Piranha, Porky, Ridley, his Meta form, and Bowser's Koopa Troop are also members of the Subspace Army. 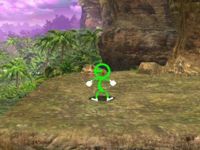 The creatures in the Subspace Army were created from Shadow Bugs, which originated from Mr. Game & Watch. The army also has in their possession a weapon known as the Dark Cannon, used by both Bowser and Wario to turn other characters into trophies. An Armank is an enemy hidden inside a tank-like structure. It moves on treads and has a functional construction arm capable of powerful attacks. Continuing to attack the arm destroys it, revealing the Armank's weak spot: a big green blob that controls the vehicle. Its name is a portmanteau of "armor" and "tank". It is the most powerful of the common units. Armights are sword-wielding, long-appendaged enemies wearing capes and armored helmets. 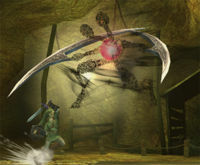 They attack with their swords while floating in the air. They appear from the background. 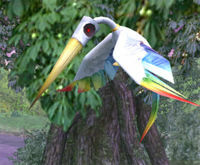 The Auroros is a pointy bird-like enemy creature. It has a long and pointy beak, which it uses as a weapon by dive-bombing from the air with its beak pointed straight at the ground. This causes massive damage to the players it hits, but gets stuck in the ground if it misses. Players can pluck them out of the ground and throw them at other enemies when this happens. On a side note, Auroros' are one of three Subspace Army enemies to appear in at least one cutscene. 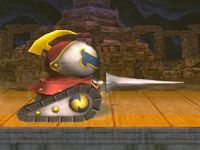 An Autolance is a cross between a knight and a tank which that moves on caterpillar treads, and uses a giant lance attached to its front to ram and sometimes shoot the player, dealing damage. Their weak spot is inside their armored helmet, in the form of an emergency light. A Bombed is a small red-and-black humanoid creature with a bomb for a head. 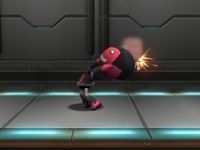 It hurls its own bomb head at the player and explodes, dealing major damage. Its weakness is its tendency to self-destruct when hit with a fire attack. A Borboras is a humanoid enemy. It is characterized by a head that resembles a wind instrument decorated on top with trumpet valves. If it spots the player, it blows wind towards the player. If the player is too close and it starts to blow wind, the player will be hit by the head. A Bucculus is a flower-like creature found planted. Its lips, the only part of them visible from the ground, are covered with spikes that stick to the player and steals health. The torso area is a pink sack storing its health, but it is not necessarily a weak point. Despite this, if it is defeated when the sac is full, it may drop a Maxim Tomato. Otherwise, it may drop Food. A Buckot is an enemy consisting of a head resembling a Primid's with a propeller, enabling it to fly; two robotic arms, and gloves on its hands. Its primary attack consists of dumping red-hot chunks of metal onto the player. The gloves are probably used to protect themselves from the very hot metal. Sometimes, probably by mistake, Buckots drop food instead of metal onto the player, thereby healing them. They appear in The Ruined Zoo, The Battlefield Fortress, The Wilds, The Research Facility, the Battleship Halberd Interior, the Battleship Halberd Exterior, The Subspace Bomb Factory, and The Great Maze. Bytans are a spherical creature with a large eye and sharklike teeth. 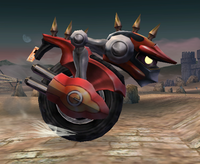 It is encountered in the Subspace Emissary mode in Super Smash Bros. Brawl. If undisturbed, Bytans will start multiplying, spawning more from their eyes, and become much more difficult to avoid. There are also large Bytans that are much stronger than the standard size. They are identical to a character from the old Game Boy accessory, the Game Boy Camera. Cymuls are floating metallic enemies whose coating allows them to reflect projectiles. 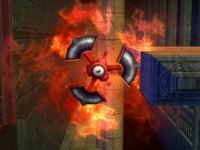 If the player gets too close to them, they will attack by rapidly spinning the four blades on their body before launching away the player with the final hit. 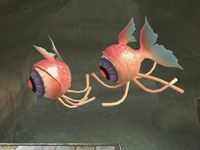 A Feyesh is an enemy with a body that looks like a one-eyed goldfish. It floats lazily through the air. When it spots the player, its eye opens and it attacks with its five tentacles. Despite its resemblance to a fish, Feyesh cannot survive in water. If their eyes touch water, they disappear, leaving behind only a few bubbles. Its name is a portmanteau of the words "fish" and "eye". Floow is a ghost-like creature, made from strips of darkness forming a humanoid shape with small red eyes. They float in the air and summon a field of dark energy, causing heavy damage. Floows can regenerate health lost over time, although they cannot move or attack while healing. 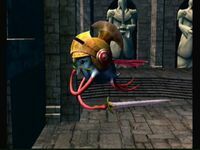 A Gamyga is an enemy with a colorful-art clown head, supported by a stepped set of four yellow bases which also have eyes and arms. This enemy is the height of the screen and it blocks the path, often forcing players to defeat it. It attacks by shooting lasers from its eyes. The bases can be attacked one by one to bring the enemy down to size, but the creature will be defeated fully only when the head is destroyed, similar to Pokeys. Trophy Stands will only turn a Gamyga into a trophy when used on the head after the body has been destroyed. Generators are black and purple portals which spawn up to thirty Mites to attack the player. 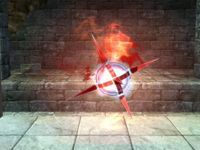 They do not stop spawning enemies until this limit is reached or they are defeated, and do not have a health bar, unlike all other enemies, making it difficult to know how much damage is needed to destroy one at any given point. They were not named until their later appearance in Super Smash Bros. for Nintendo 3DS, where they appear in the Smash Run mode. In this mode, they can also spawn other small enemies alongside the Mites, and they give more stat boosts the sooner they are defeated. A Glice is one of three "gl" wheel-like creatures that travel around the edges of platforms. 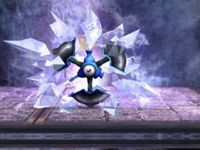 If a fighter gets near, it opens up and emits a damaging aura that protrude icicles, which can freeze nearby characters. In Super Smash Bros. for Nintendo 3DS, they appear in Smash Run, and act the same as they did in Super Smash Bros. Brawl. They are weak to fire attacks. A Glire is one of three "gl" wheel-like creatures that travel around the edges of platforms. If a fighter gets near, it opens up and emits a damaging aura that emits fire. In Super Smash Bros. for Nintendo 3DS, they appear in Smash Run, and act the same as they did in Super Smash Bros. Brawl. They are weak to ice attacks. A Glunder is one of three "gl" wheel-like creatures that travel around the edges of platforms. If a fighter gets near, it opens up and emits a damaging aura that emits electricity. In Super Smash Bros. for Nintendo 3DS, they appear in Smash Run, and act the same as they did in Super Smash Bros. Brawl. 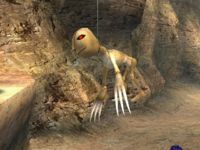 The Greap is a giant enemy with two sickles as arms. Its weak point is the red area on its head. It has two attacks, one is using a strong single hit swing to do devastating damage and knockback. Its other attack is to jump in the air and swing its arms in a large circle, doing more damage than its standard swing, but only if it lands a good amount of the attack's hits. 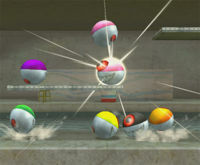 Jyks are spiked balls that move up and down or side to side in mid-air, or around the perimeter of floating platforms. They come in fire, water and electric forms, dealing the relevant type of damage. 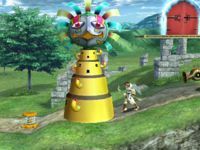 They cannot be defeated, and do not take damage - while they show a health bar, it is always "empty" - and cannot be turned into trophies with a Trophy Stand; players have to clear Boss Battles with 20 characters to unlock its trophy. A Mite is a small stick-figure creature often found deployed in groups by Generators. They are easy to defeat on their own, but are dangerous in the high numbers they spawn in. Mites' faces resemble the Subspace Emissary logo. Mites come in the colors red, yellow and green, but there are no differences between them. Only the yellow ones appear in Super Smash Bros. for Nintendo 3DS during Smash Run, though all three colors appear on their trophy. The Mizzo is a unique creature encountered only once - within the battleship Halberd, Mizzo is found in a display room. With a round body sprouting arms and legs, its appearance and swimming motions make for an extremely bizarre being. 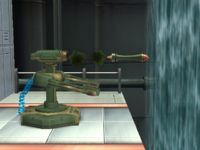 It is never encountered as an enemy in the game, and as such cannot be captured with a Trophy Stand, but its trophy can be found randomly in levels or in the Coin Launcher. A Nagagog is a sumo wrestler-like enemy with a decorative twirl on its head and a small mouth. It will start small and blue, but if it takes enough damage, it makes a laughing noise and grows larger, also turning yellow in the process. As it takes more damage, it will turn into an even larger, red version of itself. While the Nagagog is changing into a larger version of itself, it will not take damage from attacks or items. Its health decreases much faster when it is in its larger forms. It attacks like a wrestler, jumping on top of the player. Its attack is a body slam that damages players in proportion to its body size. If players are quick with attacks, however, they may defeat Nagagogs before they have a chance to reach full size. The Poppant is a rare creature with rather large trousers. 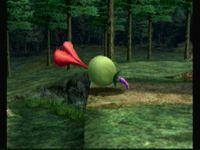 As the player draws close to it, it will run away, leaving a trail of Food and other items in its wake. 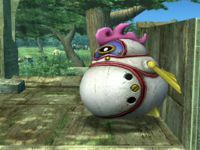 Defeating a Poppant rewards the player with more health-restoring items. Poppants appear in the Sea of Clouds, The Plain, The Battlefield Fortress, The Swamp, The Glacial Peak, the Battleship Halberd Exterior (display room only), the Subspace Bomb Factory, Subspace, and The Great Maze. 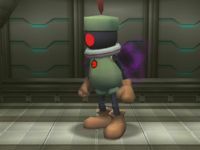 In Super Smash Bros. for Nintendo 3DS's Smash Run mode, Poppant behave as they did before and drop stat power-ups upon getting defeated. Primids are the main troops of the Subspace Army, formed from Shadow Bugs. They come in many variations, and time the player loads the Subspace Emissary, their eyes change to a different style. A Big Primid is a larger version of a the basic Primid. They attack in the same way, but are much more powerful with stronger attacks and more HP. 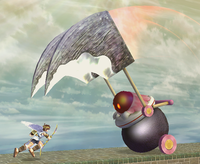 The Boom Primid is a type of Primid that wields a yellow boomerang, which they also use as a melee weapon. A Fire Primid is a fire-breathing Primid. Although rare near the beginning, they become quite common later. Fire Primids have red "caps" and bodies, while they have yellow boots and gloves. They have brown heads, arms, and legs instead of black ones. They attack by spitting a fireball similar to Mario or by using Fire Breath, like Bowser. A Metal Primid is a Primid covered in metal, similar to the effects of a Metal Box. 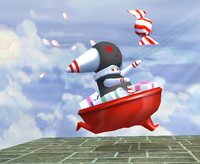 They appear in the Subspace Emissary mode of Super Smash Bros. Brawl. These Primids are heavier and more durable than normal Primids. They do not flinch from any attacks, not even a smash attack, but they do flinch from grabs and throws. They can also reflect projectiles, and they are immune to explosives. They first appear in the first stage of The Research Facility. The basic Primid is the standard troop of the Subspace Army. They are relatively weak, and do not carry weapons, attacking with punching attacks instead. Primids are one of three Subspace Army enemies to appear in at least one cutscene. 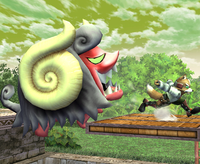 A Primid appears as a Spirit in Super Smash Bros. Ultimate. A Scope Primid is Primid with a weapon similar to a Super Scope. The rifle fires weak, three-shot attacks and powerful, single-shot surge blasts at fighters. The Sword Primid is variety of Primid that wields a green sword similar to a Beam Sword. They are slightly more powerful than normal Primids and are able to reflect projectile attacks with their swords. A Puppit is an evil marionette puppet suspended from above. It attacks with its long, sharp claws if the player is nearby or can shoot a beam if the player is farther away. It hovers around the stage, making it difficult to attack. The Roader is a motorized robotic enemy. It has only one wheel, and it zooms at very high speeds. They are very powerful enemies, and can send players quite a distance. Its high speed is its weakness, however, because if the player avoids it, it may stop and collapse on the ground, vulnerable. Roaders can and often travel in groups. The R.O.B. Blaster is a R.O.B. Sentry with beam-emitting eye lenses. They either remain stationary or are very mobile. Normal R.O.B. Sentries can also fire lasers from their eyes, but they usually do not use this attack in battle. The color scheme of the R.O.B. Blaster serves later as one of R.O.B. 's alternative colors. German Laser-R.O.B. Laser + R.O.B. The R.O.B. Launcher is a green and brown military R.O.B. Sentry. It can shoot missiles from its head to attack the player for major damage. 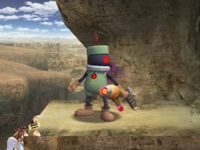 The green and brown color scheme is one of R.O.B. 's alternative colors. German Granat-R.O.B. Granate (Grenade) + R.O.B. The R.O.B. Sentries are robots loyal to the Ancient Minister (the R.O.B.). The R.O.B. Sentry uses a two-armed punch attack. Two R.O.B. 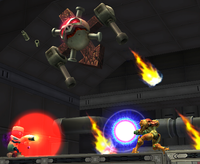 Sentries are sacrificed at a time to detonate a Subspace Bomb. R.O.B. Blasters and R.O.B. 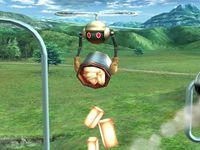 Launchers are more advanced varieties of R.O.B. Sentries. They appear in the following levels: The Research Facility, Outside the Ancient Ruins, and The Subspace Bomb Factory. R.O.B. 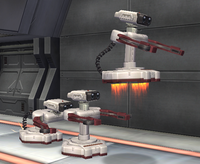 Sentries are one of three Subspace Army enemies to appear in at least one cutscene. German Wach-R.O.B. wachen (keep watch) or Wache (sentry) + R.O.B. A Roturret is a mechanized skull with a giant arrow for a body flanked by two guns. It fires at fighters when they approach. When hit, it will spin around, but quickly turn back to face the player and continue shooting. It has a blind spot in its center. 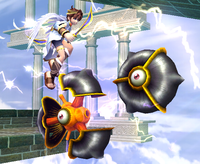 Roturrets return in the Smash Run mode of Super Smash Bros. for Nintendo 3DS. The Shaydas is a demon-like enemy comprised of Shadow Bugs. It has two heads and very long, sharp blades on its arms and shoulders. Using this blade, Shaydas can inflict a massive amount of damage on the player. The red glowing core on its chest is the Shaydas's weak point. A Shellpod is a horned beetle-like enemy with a big brown shell for protection. It uses its front legs and horns to attack. Its weakness is revealed when the player attacks its shell enough. After the shell breaks, it reveals its true form to be a blue-green creature. Without its armor and horn, it becomes much weaker offensively and defensively. 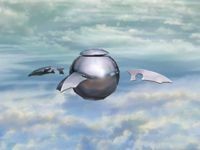 The Spaak is a cloud-like enemy that floats above the ground. It shoots lightning from the battery on its back, which is also its weak point. When hit, they will turn black and attack more aggressively with faster lightning strikes, causing more damage to fighters. A Ticken is an enemy that looks like a large, robotic chicken. Its attacks include flying up into the air and then coming down with massive force, or ramming the player with its spikes. When defeated, the Ticken breaks apart and reveals itself to be a harmless chick. Tickens appear in The Plain, The Ruined Zoo, The Forest, The Lake Shore, The Wilds, The Glacial Peak, The Subspace Bomb Factory, Subspace, and The Great Maze. Towtows are a ram-like creature. They are found always sleeping, but when attacked, a Towtow will rampage, charging at the player in response. The Trowlon is a platform-like enemy. 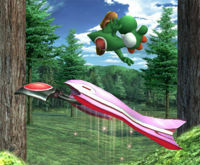 Using its trowel-like arms, it will pick up a player, and then fly upwards; this will eventually take the player out of the screen, thus causing them to lose a life. 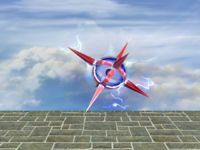 However, it can be used to ascend the player to the top of an area as long as the player jumps off at the correct timing. This page was last edited on March 14, 2019, at 15:14.